MELT chocolate morsels and butter in a large saucepan over low heat. Add marshmallows and stir until completely melted. Remove from heat. PRESS mixture using buttered spatula or wax paper into 15 x 10 x 1-inch pan coated with cooking spray. Cool slightly. CUT cereal mixture into shapes using large circle cookie cutter, very small circle cookie cutter and rabbit head cookie cutter coated with cooking spray. 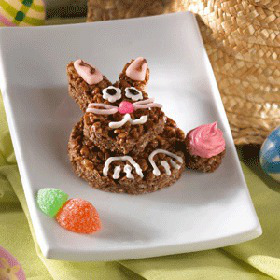 For each rabbit, attach one rabbit head shape to top of large circle shape with frosting. Attach one small circle for tail to each. Decorate with frosting and/or candies. Best if served the same day. Prep: 20 min, Total: 40 min. These are so cute! The kiddos are going to love this one. I am going to the commissary today to get the items to make it.